SEOUL, South Korea--(BUSINESS WIRE)--Samsung Electronics Co., Ltd., the world’s largest provider of thin-film-transistor, liquid crystal display (TFT-LCD) panels, announced today that it has completed development of a flat panel X-ray detector (FPXD) for radiology machines, in collaboration with Vatech Ltd, a Korean medical machinery manufacturing company. 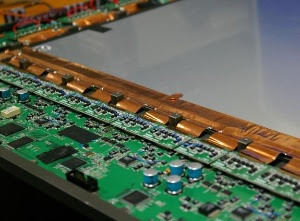 By using digital imaging with thin-film transistor (TFT) technology, the diagnostic process is enhanced in many ways. In addition to delivering a much more precise image, Samsung’s new FPXD imaging sensor can save medical labs considerable time and money because no film or development process is needed. An X-ray detector is an elaborate imaging sensor that converts invisible X-ray images into digital signals, which are then instantly transformed into pictures. Today, the medical profession still relies primarily on costly, plastic-based analog film for X-ray photography applications, which can take an excessively long period of time to develop in many medical situations. The new FPXD measures 45 centimeters (cm) wide x 46cm high (or 61cm diagonally) and boasts a 3072 x 3072 (9.4 megapixels) resolution providing ultra-high definition images. The new Samsung FXPD technology has virtually an endless range of applications beyond conventional X-ray systems. For example, it can be adopted for more advanced diagnostics such as CAT scans, for building inspections (scanning rebar structures, etc.) and for airport security scanners. To create its FPXD, Samsung attached photodiodes to a TFT substrate that was produced using its proprietary amorphous silicon technology. The X-rays are detected photon by photon and then converted into visible light, which in turn is converted to electrical signals that can be displayed as diagnostic images on a flat panel screen. In addition, Samsung has created an image enhancement function to eliminate most digital image noise interference to provide the highest radiographic sensitivity in the industry. Samsung’s expects that its new, FPXD one-stop, total solution will secure the leadership position in the growing market for medical equipment detectors. The device will be available worldwide beginning first quarter, 2008.